How long does an electric car need to load? What is a three-phase load? Does the electric vehicle charge faster when I use a thicker electric cable? What influences the loading speed? In order to answer these questions, you first have to get a brief overview of physics and electrical engineering. In the electric cars are usually installed lithium ion batteries with the current state of the art. These batteries belong to the chemical energy storage. This means that the charging and discharging of the battery occurs after a certain charge and discharge curve. If the batteries are charged quickly and with high power, then the lifetime is reduced by the faster destruction of the rechargeable batteries. If the charging power is too high, a fire could result from overheating of the batteries. Therefore, the charging speed will always be below the maximum possible. This affects accordingly also on the electric car charging time. Now you understand why you can not simply answer the question "how long does an electric car need to load". Now you have to provide the maximum charging power, which can gently charge the battery. Since the battery is charged with DC, there are two ways of charging. 1. The conversion AC voltage from mains takes place in the charging station. The battery is charged directly from the power supply with direct current. This is Mode 4 charging via a DC charging station (CHAdeMO or CCS connector), which converts AC voltage into DC voltage and, via suitable plugs, supplies the DC voltage directly to the electric vehicle. 2. The conversion AC voltage from the grid is done in the car. The battery is charged by the power supply via an AC charging station (Mode 2 or 3). The AC voltage arriving in the electric vehicle (type 1 or type 2 plug) is converted into a DC voltage in the car and thus the battery is charged. By charging the electric car in option 1. is charged directly with DC and this allows a faster electric car charging time than with AC voltage. So if you connect the kettle with this power will flow 8.7 A current, so that the kettle converts this energy into heat energy and we have hot water. So now back to electromobility. In our case the consumer is the electric car. The electric car is individual: manufacturer - / model - / and even equipment-related. Partly, the battery management systems are different, where in these at too high temperature of the battery or other signals, the charging power is reduced. Accordingly, every electric car consumes individually. So it does not help you if you install a thicker cable with a larger cross-section of the copper at the power supply. If the car is rated single - phase for a maximum charge of 16 A, then you will not be bothered with a 3 - phase cable or a 32 A (32 A) power supply. 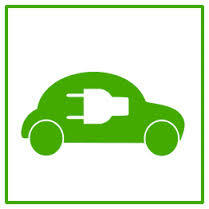 The electric car will only take the maximum 16 A current from the power supply. The only difference is, conversely, if you have only a lower power available from the grid than the E car could charge, then this is limited by the charging station (by a resistance coding) the charging power maximum. So, if you want to know how long it takes for an electric car to charge the battery, you first need to know what maximum charging power the electric car is designed for or how much the charging station can provide. You will find this either in the lid of the electric vehicle where the plug is plugged in or in the manufacturer's technical data (eg in the manual). In order not to create a confused confusion or there are standards for collateral, as in many technical things, the components and processes are standardized. Since the DC charging stations by the conversion of AC voltage to DC require greater technical know-how and more components than the AC charging stations, these cost usually over 20 000 €. That is why these DC charging stations are mainly used in public areas. That's why I'll explain more about AC charging stations, where you can charge your electric vehicle at home or at work (at the employer's). What is 1 - phase load or what is 3 - phase load? Here we come again briefly understandable to speak on the basics of electrical engineering. 1 - phase means that you only have one phase in the energy supply. In that case it would be the brown single wire from the line (eg normal household power outlet) on which 230 V voltage prevails. The blue wire is always the neutral conductor. The green - yellow wire is always the PE (Protective Earth) - as the name suggests, the wire may only be used for protection purposes worldwide. Note: If you use the wire as a live phase or as a neutral or see that it is being used, then it must be corrected immediately. The electrical installation recognizes via this wire with the upstream protective devices such as miniature circuit breakers, fuses, RCCBs and many other protective devices if there is a fault in the electrical installation and the fuses break loose. Thus, personal injury (in the worst case - death) or property damage is eliminated or reduced. As a power supply is thus a wire available, where current can flow from the phase to the neutral conductor. There are international and national regulations for this installation. For sockets, a 16 A fuse in the form of circuit breaker is normally used. The theory could therefore be connected to a consumer of 230 V x 16 A = 3680 watts (about 3.7 kW). Practically you will never reach this, otherwise the 16A would fuse. Thus one can not count on the charging power of the maximum power of 3.7 kW specified by the manufacturer. Also one must not expect with scarcely under 16 A, since the line or the transitions z. B. in the fuse would be hot and it could come in the worst case to a fire. Realistically you can expect about 13 A x 230 V = 2990 watts. So you have to count on all other performance data. Then you come to a realistic flowing current. With this power, you can now calculate the charge time in connection with your battery capacity. Here I give you an example and in our electric car charging time calculator you can get a short result with your information. You can now use this formula to calculate the charging time for your electric car. Do not you have an electric car yet? No problem HERE you will find our electric car comparison, where you can see the electric cars currently on the market and like to use the technical data for the charging time calculation. If you do not have any information or if you would like to know more about the basics or further information about electromobility, please do not hesitate to contact us and we will be happy to help. Click here to contact us!